There’s no doubt about it, sunglasses make you look great. However, research suggests that they also play an important role in keeping your eyes healthy by helping to slow or even prevent the development of cataracts and macular degeneration. Sunglasses do this by dramatically reducing the amount of potentially harmful ultra-violet light that enters your eyes. Ultra-violet light, or UV, comes from the sun’s rays. The best sunglasses have a UV400 filter, which prevents 99-100% of UV rays from reaching your light-sensitive retinas. Although UV helps our bodies to produce vitamin D (and gives us a nice tan), it’s worth remembering that our eyes are ten times more sensitive to UV than our skin. And don’t be fooled by cloudy days: UV rays can be present even when conditions are overcast. If you want to look dashing while you’re driving, gorgeous while you’re golfing and tip-top playing tennis, sunglasses will help you do just that – and they'll help protect your eyes while you’re at it. They might even give you the upper-hand over your sunglasses-less opponent. When you’re out and about you want sunglasses that protect your eyes without ruining the view. Maui Jim has built a formidable reputation in the sunglasses industry, lenses reduce 100% of harmful UV while its multi-layered PolarizedPlus2® technology produces vivid colours without the levels of discolouration you’d expect from normal sunglasses. Alternatively, grey or brown lenses in your sunglasses also keep distortion to a minimum. If your eyes are particularly sensitive to bright light, try photochromic Transitions lenses, which darken automatically according to the amount of ambient UV light. Kids are at greatest risk from harmful UV rays. In fact, 80% of the total amount of UV light that enters the eye over a lifetime will do so before the age of 18. The cumulative effect of UV absorption means it’s important that children wear sunglasses whenever it’s a bright outside. It's an easy sell: kids love looking cool! Be warned: many ‘toy’ sunglasses are just tinted lenses offering zero UV protection. So make sure your kids wear sunglasses with a certified UV protection rating. A good pair of skiing goggles are nothing short of essential. They help prevent snowblindness, a temporary but very painful condition that can cause partial or even total loss of sight. Snow is a very effective reflector of UV light, bouncing as much as 80% of it back into the atmosphere – and into your eyes. That’s why skiers prefer mirror-coated lenses that block the maximum amount of UV rays. For one of the best in the business, try Oakley goggles with Prizm snow lenses, available to order from any branch of Leightons. From serious cycling competitors to Sunday afternoon enthusiasts, you’ll probably want a pair of wraparound sunglasses to help keep distracting light to a minimum. Try a colour lens to improve contrast in bright weather, such as Oakley’s Prizm lenses or its sports-specific prescription varifocal models. Golfers demand maximum accuracy and minimal distortion. Many golfers choose green lenses, with wraparound sunglasses proving very popular for their immersive, distraction-blocking qualities. Check out Maui Jim’s HT lenses and Oakley Prizm lenses – both are available in models designed for the grand old game of golf. And make sure you practice in your new sunglasses to get used to them. Runners want comfort and durability – they need sunglasses that stay firmly in place mile after mile. A comfortable fit and protection from UV rays are the name of the game, so take a look at the lightweight and stable Maui Jim Hot Sands sunglasses, or the Oakley Flak 2.0 which use specialist materials around the ears and nose pads to make sure they stay firmly in place while you’re pounding the streets. To block out harsh reflected light and to get an even sharper view of those elusive fish, try polarised sunglasses. They dramatically cut down on reflections, letting you see further into the water. Your local Leightons Opticians & Hearing Care branch is the best place for advice on sunglasses, from prescription sunglasses to the best styles and frames. 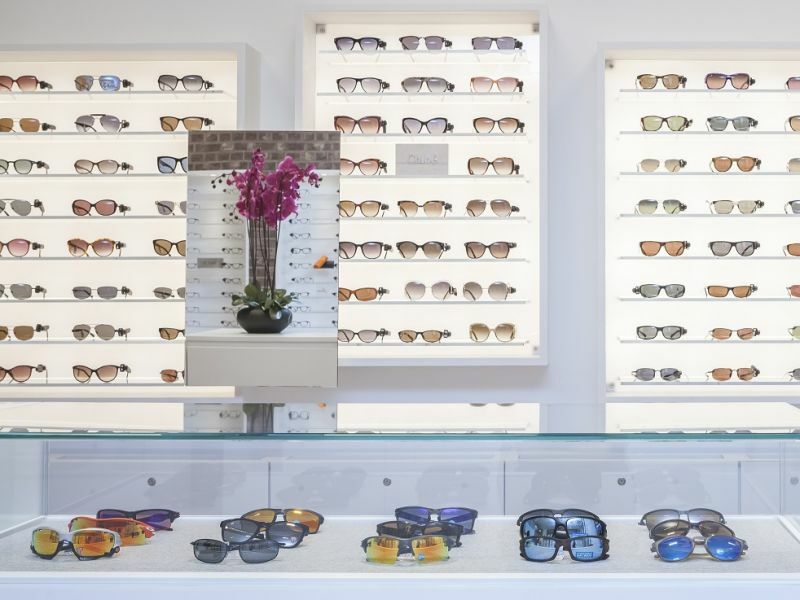 Choose from a range of top brands, including Maui Jim, Tom Ford and Ray-Ban. We’ll even help you find the best styles to suit your face shape. Whatever your favourite activity, sunglasses are a wise investment. Just call us on 0800 40 20 20 or book an appointment online.